2.4 GHz is the new state of the art in digital cordless phone technology. Gigahertz refers to the number of cycles per second. 2.4GHz is faster, cleaner and more secure than 900 Megahertz. The 2.4GHz technology allows for exceptional voice clarity, clear cordless transmission without static or interference from baby monitors and other cordless phones operating at crowded lower frequencies. Added security comes from the fact that these phones change frequencies over 100 times per second, making it very difficult for others to eavesdrop on your private conversations. Can I get a built-in answering machine with my Siemens 2.4GHz Gigaset cordless telephone? Yes you can! The the two line Gigaset cordless phone model 2420 both include a high quality, full-featured digital answering machine with 22 minutes of memory and 4 outgoing messages. For added convenience, your messages can be checked from any Gigaset handset or remotely from any touchtone phone. Can I get a Gigaset phone with Caller ID or a speakerphone? Gigaset models 242, 2415, and 2420 come with caller ID. However, you should check with your local phone company on caller ID availability in your area. Additionally, the 2420 Gigaset phone comes with the speakerphone feature. Where are Siemens Gigatelephones made? Siemens' telephones are designed and manufactured domestically with U.S. and imported parts. They're made by Americans for Americans! Will other people be able to listen in on my conversations? With the Siemens Gigaset phone system, you no longer sacrifice call clarity and security for the convenience of cordless phones. ADPCM digital voice encoding gives you remarkably clear reception (uses a 32Kb channel - same as sophisticated telephone network equipment). Frequency Hopping Spread Spectrum technology provides high security, ensuring that your calls are secure from eavesdropping by randomly changing the frequency at which the signal is transmitted over 100 times per second. What is the level of voice clarity on a Gigaset phone? Every Gigaset telephone utilizes 32 bit ADPCM (Adaptive Differential Pulse Code Modulation) technology to deliver the highest voice quality. This allows for the clearest, most impressive sound you can get out of a cordless phone. What kind of range can I expect from my Siemens Gigaset cordless telephone? The range on the Gigaset can be up to 1000 feet; however, range indoors is typically 150 feet. At the 2.4GHz frequency, signal is very susceptible to environment and building density. If you are in an open area indoors, range can be significantly better than if you are in a building with a lot of thick walls, particularly if the walls are very dense (concrete, steel, etc.). Gigaset 2420 was designed for home office / small office / residential use. It works very well under normal conditions in most of these environments. Can I charge Nickel Cadium batteries and Nickel Metal Hydrid batteries together? Do not charge NiCd and NiMH batteries in the same compartment. Since Gigaset telephones allow you to charge 2 sets of batteries at the same time (via 2 separate charge slots, one located on the handset and one located on the base unit), you can charge one set of NiCd batteries and one set of NiMH batteries at the same time, provided that you keep the same battery types together. You must NEVER place alkaline or lithium batteries in the charger. What's the difference between the 240/242 Gigaset phones and the other models? The 240 and the 242 are single line non expandable cordless phones. They offer the same voice clarity and some of the features of the other Gigaset models, but the 240 and the 242 do not allow for additional handsets to be added to your system. The 242 features Caller ID whereas the 240 does not. 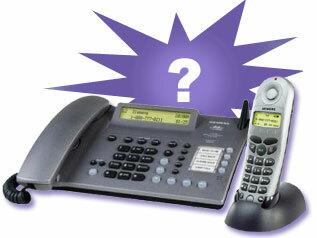 Will the Gigaset work behind a PBX? It will work if certain conditions are met. The PBX must have an analog line and must provide a minimum line voltage (48 volts DC is preferred), and the ringing voltage must be sufficient in both voltage and length of signal. I want to wall mount my Gigaset 2420 desk station, but there's no way to do it. Why? The desk station was designed solely for desktop use. In a typical office environment, no wall mount is close to the work area. How do I insert a pause in a number when I enter it into the directory? On the desk station, the volume-reducing key ( V ) inserts a pause. The display will show "P" whenever a pause is inserted. On the cordless handset the display will prompt you. After you have entered the name, type in the first set of numbers for the entry. When you reach the point where you want to insert a pause, press the right soft-key (OK). Then scroll down to "Insert Pause" and press OK again. The display will now show the original set of numbers plus the letter "P" at which point you can enter the rest of the numbers and save the entry. Is there a call timer in the phone? Yes. It can be set to on or off. What kind of batteries does the Gigaset use? Siemens provides two AA size nickel cadmium rechargeable batteries for each handset. The desk station does not require any batteries. Are other batteries available for the Gigaset phone? You may also use AA size nickel metal hydride rechargeable batteries. These are compatible with the charger. Talk and standby times will vary. You must NEVER place alkaline or lithium batteries in the charger. Typically, nickel cadmium batteries need about 24 hours to fully charge the first time; thereafter it can take up to 12 hours to fully charge (from complete discharge). Nickel metal hydride batteries usually require only about 15 hours to completely charge. The time required to charge batteries is affected by the condition of the batteries and the power of the charger. It takes significantly longer to charge batteries in the spare battery compartment. Do I have to condition the batteries before I can use them? One of the characteristics of nickel cadmium batteries is that they must be fully charged before their first use and completely drained before they are recharged. For this reason, Siemens has put a spare battery compartment into the charger. This will ensure that you always have freshly charged batteries available. The reserve charger in the charger stand doesn't seem to work. The reserve charger provides a low current trickle charge to the batteries. It will take from 60 to 100 hours to fully charge batteries in the reserve charger. Once batteries are charged in the reserve compartment they are maintained at full capacity. Can I leave the handset in the charger cradle between calls? We recommend that you leave the handset OFF the cradle until the batteries are fully discharged. This will prolong battery life. Or you might consider purchasing a set of Nickel Metal Hydrid (NiMH) batteries. NiMH batteries do not have a memory and therefore can be recharged at anytime. What is the warranty period for my Gigaset 2420? No. The warranty is valid only for the original purchaser. Proof of purchase is required. I changed the PIN number on my Gigaset and forgot it. How can I fix this? Contact the Siemens Customer Care center at 877-267-3373. A representative will be happy to guide you through the procedure. What if the Answering System is not answering? The system is configured with the Answering System default set to "On", but you can disable it. Check to see if the Answering System has been disabled. I don't have any Caller ID information on the display.What's wrong? Caller ID is a subscription service supplied by the telephone company. You must subscribe to be able to use it with your system.